AND SOMETIMESIt starts with little things. Missing keys. A flat tire. Mysterious flowers. All easily explained away if the pattern wasn't so terrifyingly familiar. Leah has a new veterinary practice and a new life with no ties to her nightmare. But Tennessee Bureau of Investigation agent Alex Morgan suspects something. And when another woman's body is found, stabbed twenty-three times, Leah knows her past has found her. A fantastic read. I won't be happy now until I've read every single book in Mary Burton's backlist! 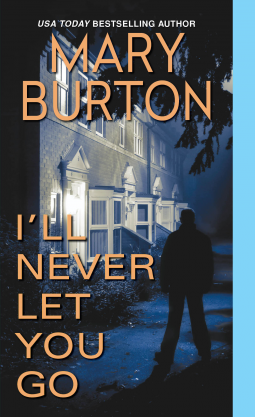 Dark and thrilling, I'll Never Let You Go had me awake until late into the wee hours after reaching the end of the book and not being able to let it go. It is atmospheric and full of suspense. The author pulls no punches with the killing of her characters and there is a real sense of danger and terror enveloping the story. I loved that the romantic side of the plot, although evident, was placed firmly in the sidelines to allow suspense and drama to take centre stage. From the opening chapter I developed a liking for and attachment to Leah who had to suffer and survive domestic abuse, stalking as well as having to make a slow trek back from death's door after a horrifying attempt on her life. I inwardly cheered for her as she got her life back together and made new friends. I liked Alex as well despite his emotional detachment from people. His professionalism and genuine concern for Leah won me over fairly quickly. The mystery and suspense unfolded with many twists and turns. I thought very early into the novel that I had a good idea of how the story would go but I was wrong! I was not expecting the twists that occurred and I was as genuinely surprised as the characters themselves at the turn of events towards the end of the novel. Thank you Netgalley and Kensington Books for providing me with a review copy.